Help! 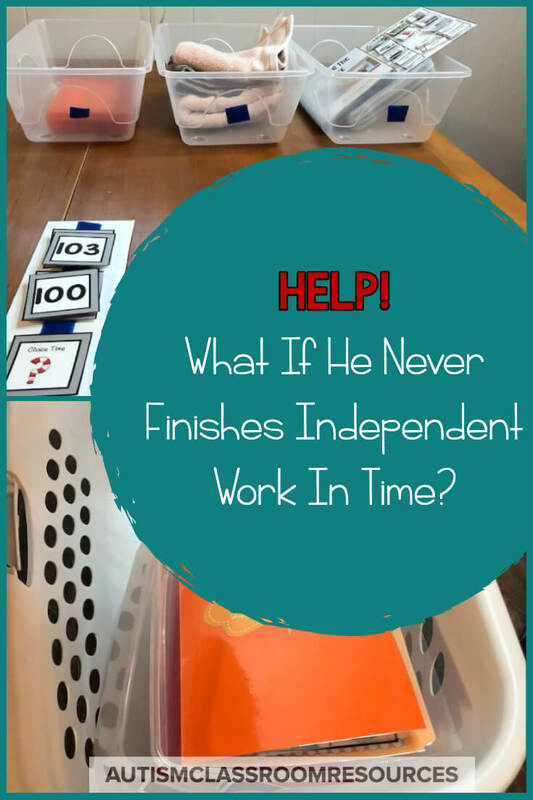 What If He Never Finishes Independent Work In Time? Today’s post comes from a question I frequently get asked about independent work systems. What do I do about a student who never finishes independent work tasks within the center time? 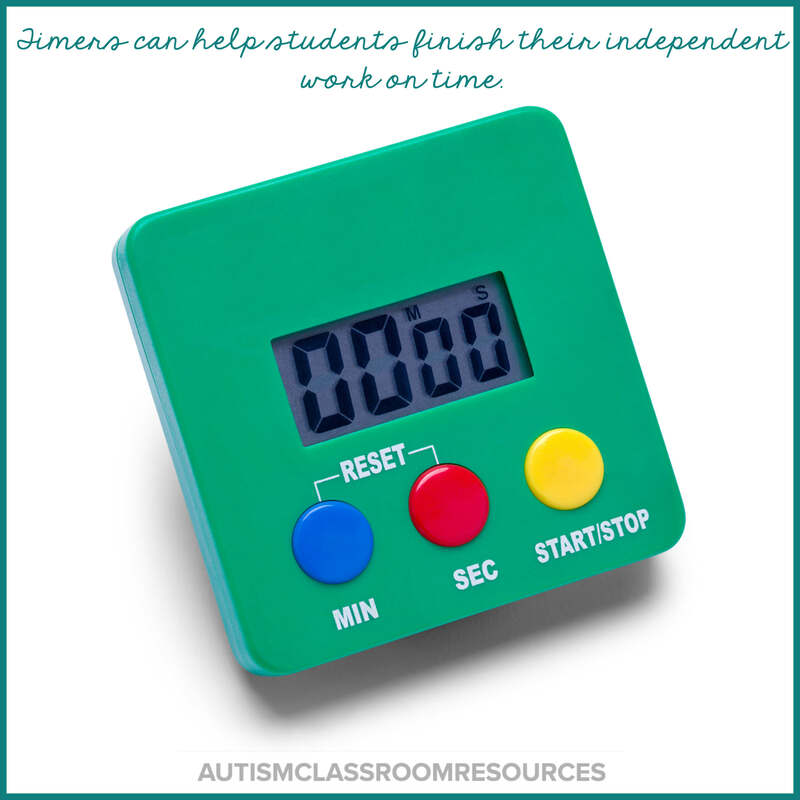 When you incorporate independent work into a classroom schedule, there has to be a time that it finishes and the classroom moves on. But since your goal is to get the student to do his work on his own, what do you do? Before we decide how to approach the student at the time he isn’t finishing his work, we need to try to figure out where the problem might be happening. So the following are some questions to ask to figure that out. 1. 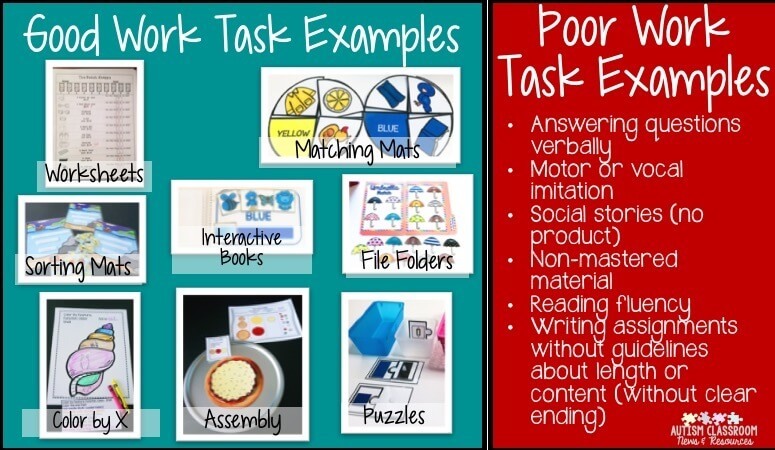 Do You Have the Right Tasks? First, remember that one of the keys to doing independent work systems right is to make sure that you have given the student the mastered tasks and tasks. If the work isn’t previously mastered, he won’t be able to do it independently. Next, you have to make sure that the tasks have a clear beginning and end. If a student doesn't know how to tell that something is finished, she will often put it part way together and then take it apart. Then she’ll never finish. Has the student previously mastered the task? Can the student complete the amount of the task in the time period? Is this work he is familiar with? Does the task have a clear beginning and end? Does the student know what is expected of him to complete the task? Does he know when the task is complete and can be put away? Looking for more ideas for creating independent work systems in your classroom? Check out the FREE webinar below...click the image to find out more and watch as soon as you register! 2. Does He Know What to Do Next? One reason why a number of students don’t get their work done in independent work is that they either don’t know what they should do next or they don’t want to do what comes next. Indicating what comes next is one of the 4 critical questions to answer with an independent work system. It’s easy to forget that “what’s next” visual on their schedule. When it’s not there, students don’t know what their incentive for finishing is or they aren’t motivated. I can’t tell you how many times, just adding the reinforcer visual to the end of the independent work schedule resulted in the student sitting down and finishing his work quickly. 3. Is What’s Next Motivating? 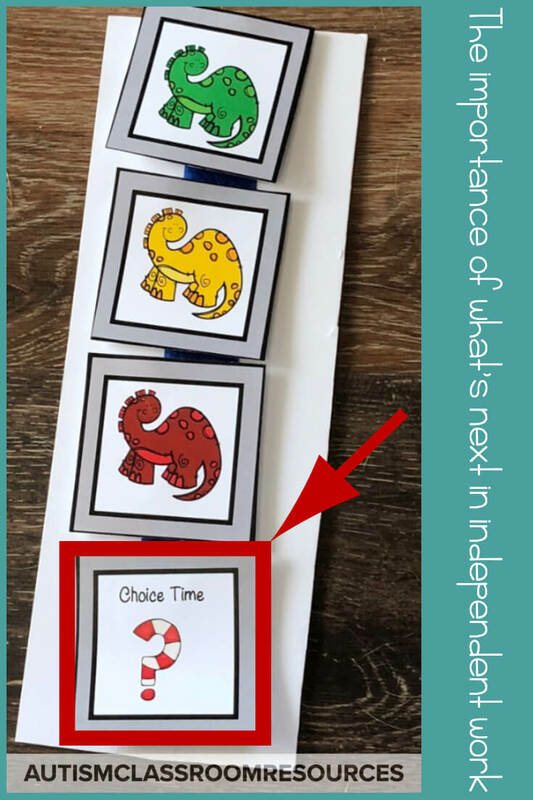 What if you know the student can do all the work easily and you have a what’s next visual on the schedule, and he still isn’t finishing independent work? Then the next question would be whether the “what’s next activity” is something that is motivating. If it isn’t being reached but we know he can do the work, then perhaps what we are using as a reinforcer isn’t really reinforcing him. In that case, go back and ask what seems to be working as a reinforcer for the student in other areas. Or you can go back and redo your reinforcer or preference assessments. You can find some great links to those in this post. You need to find something that is really powerful that will work to reinforce him for completing the series of tasks in independent work. Once you have resolved and determine that the student knows what work needs to be done, is able to do it independently, knows when the work is finished, knows what to do with it when it’s finished, and knows that what comes next is highly motivating for him, then, what do we do? Then you can stick to the time you have allotted for independent work systems. And, by doing this you are going to use differential reinforcement. That means, if he finishes all his work quickly, he gets a longer time with the reinforcer (or more of it if it’s a tangible item). If he doesn’t finish his work in that time period, then he doesn’t get the reinforcer. So, he gets more reinforcement for working quickly to complete his work. If you do all these steps and hold him to the time schedule and he still has a whole week or two where he never (or almost never) finishes his work, you can use these strategies to further troubleshoot. Reduce the amount of work he has to complete and see if it gets finished. Perhaps he’s getting overwhelmed even though you know he can do it. Change the time of independent work so that the reinforcer is really motivating. For instance, if you are using an edible reinforcer, have work time before lunch rather than after. Try using a social narrative for how independent work is done (we have one in the Special Educator Academy Social Narrative Bank. Try a contingency map that shows him that if he finishes the work by X time, he gets the reinforcer. If he doesn’t finish it, he doesn’t get it. Use a timer to show him how much time he has to finish the work. Hopefully these strategies will help you troubleshoot and get your student to finish his work. Have other strategies you like to try or questions? Drop a comment in our private Facebook group for special educators.